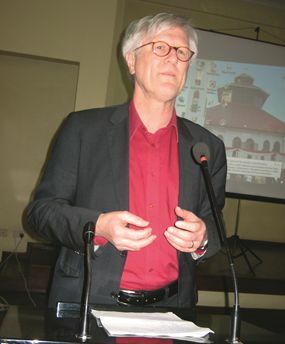 Bishop Dr Heinrich Bedford-Strohm who is the Chair in Systematic Theology and Contemporary Theological Issues at Otto Friedrich University, Bamberg, Germany has advised the Evangelical Lutheran Church in Tanzania (ELCT) to establish a committee to monitor climate change and its impact in the country. Presenting a paper on Poverty, Wealth and Ecology  A Theological Perspective recently at a consultation of Bishops from Tanzania and Germany (VELKD) he said given the global consensus about universal values on human rights, the fact that around 25,000 die every day from preventable diseases and reasons is a moral scandal. During discussion the bishops were of the opinion that there was need for faith based organizations to get involved in plans to conserve the environment especially on how to deal with plastic wastes that have become a threat to the environment in Tanzania. Rapid climate change increasingly manifest through droughts, storms and flooding has made it impossible to further deny the social, cultural and ecological destruction that characterizes the dominant ways of doing economics. The wide gap in the consumption of natural resources between the wealthy countries of the north and many poor countries of the south reveals the major injustices which need to be addressed in search of a sustainable and just economy for this and subsequent generations. We need to understand why some countries profit from globalization while others dont and also evaluate how these different effects coincide with the global dynamics of inequality deeply rooted in the historical injustice of colonialism. Markets need a framework of rules which ensure fairer trade which prevent the exploitation of developing and impoverished nations and which lead to the most possible mutual benefit in trade relations. The ethically grounded vision of creating equal societies confirms the need for the ethical task of faith communities who want to turn their members attitudes and behavior away from a culture of greed fuelled by consumer driven debt and market based acquisition. This vision leads to a concept of just participation for all on a global scale which needs to go hand in hand with the use of renewable natural resources which is ecologically sustainable, freely available and gives every one more equal access to energy resources such as wind, air, wave and solar. No person is an island. Therefore alternative models of global economy of solidarity while taking into consideration the existence of self interest and even egoism. Therefore, should there be the possibility of gaining profit as an incentive to generate wealth, it ethically acceptable that everyone and especially the weakest should participate in order to generate people-centered approach to economics rather than a mere profit mentality. There is a challenge in creating a model that allows the sharing of globalized benefits for all countries and all segments of societies to profit from the economic advantages of globalization. Incentives must be developed to ensure prosperity will not have to rely on an ecologically destructive growth. Improvements in education, the enhancement of environmental well being and measures that seek to eradicate structural poverty and inequality should all be considered when measuring economic progress. Churches need to take action by moving towards an open discourse beyond any dogmas in addressing abuse of fundamental ethical and human rights issues. Professor Dr Heinrich Bedford-Strohmholds the Chair in Systematic Theology and Contemporary Theological Issues at Otto Friedrich University, Bamberg, Germany. He is Extraordinary Professor in the Theological Faculty of Stellenbosch University and Director of the Dietrich Bonhoeffer Research Centre for Public Theology in Bamberg. Bedford-Strohm is also President of the Society of Protestant Theology in Germany and Deputy Chairperson of the Chamber for Social Responsibility of the German Protestant Churches. Since 2009 he is the main editor of the journal Evangelische Theologie.